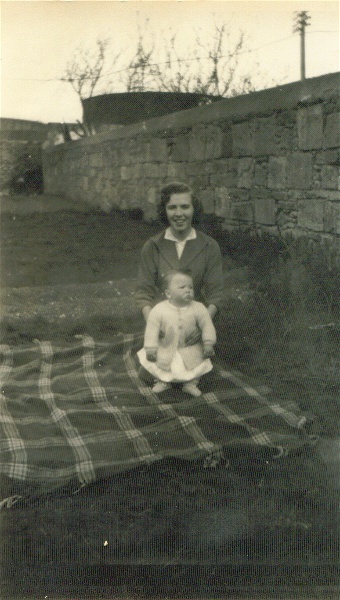 This is a photo of Isabel Anderson Moir, daughter of Davie and Jessie Moir, and 16 year old me, taken in the Moir's back yard in 1956. Somehow, I missed picture #545 when I first discovered this site and only recently came across it. Davie and Jessie were very kind to me and I admired their relationship to each other and to Isabel (the apple of her father's eye - he was so proud of her). Thanks again Liz Taylor (nee Askew) for responding to my query under picture #545. Give my regards to Jessie. Nice photo Margaret, I too have a photo of Isabel. She was a very popular wee girl and her parents were well liked in the town. Her mother, Jessie, used to work in my Uncle's shop (Big Dave) and I always got on so well with her and Davie. Is her brother Fraser Moir picture #1336 and picture #720 ? Isabel Moir's brother is Fraser, who also appears in picture #373 (right in front of me). Talked to them both last year in Dornoch where they run a shop/tearoom together. Kenny MacCormack many thanks for the information. Still so much to learn!